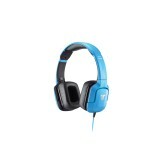 Style, comfort, and good audio at a reasonable price. All in plastic, so treat it right if you want it to last. The TRITTON Kunai Mobile Headset is a great value for what you get. It’s quite comfortable, even for long sessions, and it’s stylish too. Throw in the convenience of in line controls at a reasonable price point, and you have a gift that will be well received this holiday season. Ah, headsets. Such a simple thing, really, but so complex at the same time. When they work properly, you hardly even put a thought into them – they are just a tool to facilitate your life. But when they aren’t ideal, you definitely notice the finer points of a quality headset. From exceptional comfort and a sleek design, to outstanding audio quality and conveniently placed controls, the Kunai lays claim to everything on your checklist for an ideal mobile headset, but how well does it really perform in the trenches? If looks are your thing, you’ll find a lot to like in the Kunai Mobile, right from the start. Even the package has that sleek, understated look that is sure to bring a smile to the faces of those who find one of these under the tree. One side is clear, giving you a glimpse of the headset within. They come in your choice of a variety of colors including orange, black, cyan, and red, making it easily distinguishable from your other headsets, and easily suited to your personal preference. As you open the package, you’ll find it comes with everything you need for your optimum audio experience, including some sweet Tritton decals and a small pamphlet on using it. Of course, you won’t need much in the way of instructions – it is a headset, after all – but it does include convenient buttons right on the cord. This makes it super easy to use your phone, tablet, or handheld console without a lot of fuss and fumbling. If customizing is your thing, you’ll love the two extra sets of interchangeable ear plates that come with the Kunai Mobile. These allow you to easily switch out colors anytime you like. These cover the back of the earpieces, and attach with a tab at the bottom and magnets on the top, so they truly pop in and out in an instant. While that certainly doesn’t make or break the headset, it’s a fun feature. And now, the million dollar question – how do they feel? Let me tell you, I’m tough to please when it comes to comfort and headsets. They can sound like a choir of singing angels, but if it hurts to wear them longer than ten minutes at a time, they simply are not for me. Thankfully, the Kunai Mobile seems built with long term comfort in mind. The ear pieces are very generously padded, and that padding has a lot of give to it too, making them set around your ears quite comfortably (and helping to drown out background noise as well). The underside of the headband is gently padded as well, and the sides pull out several inches for size adjustment. The earpieces swivel to the side, which makes for both a comfortable fit and easy wearing around your neck when you need to take them off for a bit. Most importantly, everything is prettyy sturdy (no flimsy or tiny parts here – it’s all solid plastic). The Kunai Mobile should stand up to extensive use, if treated right. Finally, we come to the most important question when considering a new headset – how do they sound? Its 40mm Neodymium drivers are designed to offer smooth audio, and they deliver on that promise wonderfully. Everything comes through crystal clear in all ranges, and even the bass sound is top notch. This is a headset intended for mobile use, and has controls built in to the cord for easy call answering on the go. You can be listening to your tunes, take a quick call, and go back to your beats – all without even glancing at your phone. The removable microphone has reasonably good noise canceling, so you won’t be bothered by outside noise.